Singapore is the forerunner of the startup ecosystems in Asia that made it to Compass’s 2015 Global Startup Ecosystem Ranking, and the country’s economic milieu continues to prove its resilience with a forecasted GDP growth rate of 2–4% in 2015. 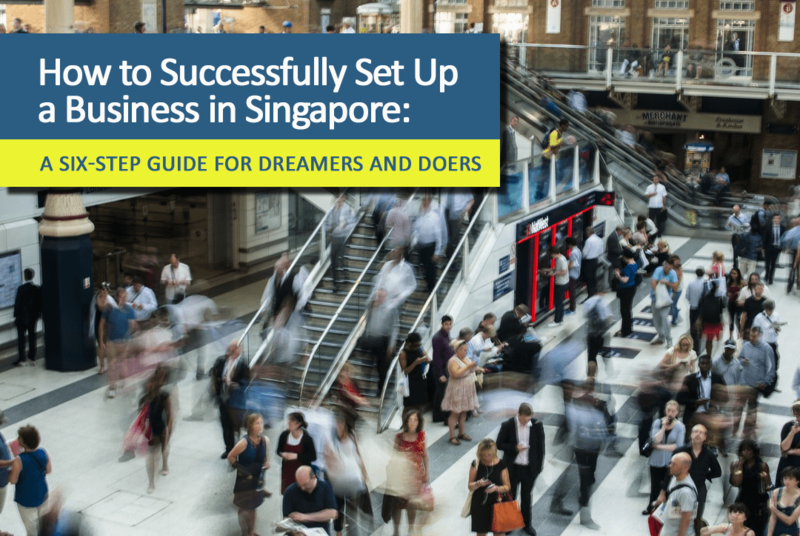 So the only thing standing between your dream of registering a business in Singapore and reality is a string of regulatory requirements and procedures. Knowing what those transactions are may come easy. While there are many accessible platforms of information nowadays, accomplishing everything without neglecting what matters most in your venture is a different story. Therefore, you need strategies that will generate value for the main areas of your business starting day one. “A good strategy provides a clear roadmap, consisting of a set of guiding principles or rules, that defines the actions people in the business should take (and not take) and the things they should prioritize (and not prioritize) to achieve desired goals,” explains Michael Watkins in his Bloomberg article in 2007. You must have heard this gazillion times from superstar CEOs and entrepreneurs: Your business should be about something you believe in. Well, the template is true. When you are passionate about your product or service, you won’t run out of steam amid shifting business weather and inevitable hurdles. If you can cross that criterion off this list, you get a five. Get it from your market. Is your business idea sustainable? Are there opportunities in the market? What are the trends and predictions? Consider looking at the global and regional startup trends or economic forecasts to help you build a solid business plan. Where will you get your funds? Do you need partners or network? What are your short-term and long-term plans? What are the specific achievements you want to see after a certain period? The more you clarify your plan, the easier the succeeding steps will be. When you already have a clear-cut plot for your business, it is time to choose the most suitable structure. Your business structure will have an impact on your legal and tax standing. Your strategy now is to study your options and their differences. The ultimate question: What business structure suits your business, your capacity, and your long-term objectives? Are you going to register your company as Limited Liability Partnership or Sole Proprietorship? Or do you want to operate as Private Limited Company (PLC)? Meanwhile, if you are a foreign professional who wants to take advantage of the vigorous business condition in Singapore, there are routes you can choose from according to your situation and plans. 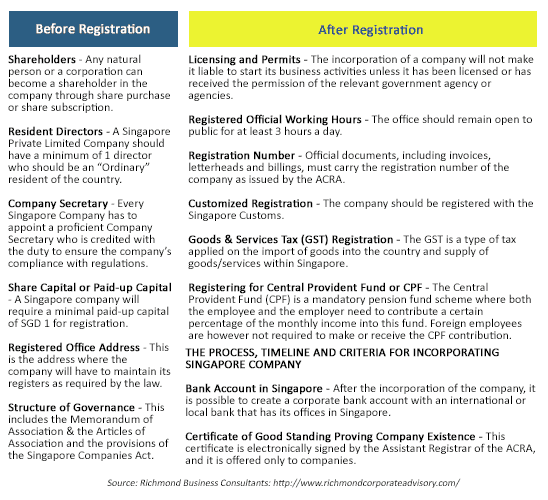 You can register your business in Singapore without relocating to the country or you can form a company first and relocate afterward. For technopreneurs and R&D-based ventures, you just have to go through the Singapore company incorporation process before relocating and operating in the country. The key to your selection process is to identify the structure that can cover your specific needs and business goals in the long run. Coming up with a name for your future company in Singapore can be quite tricky. 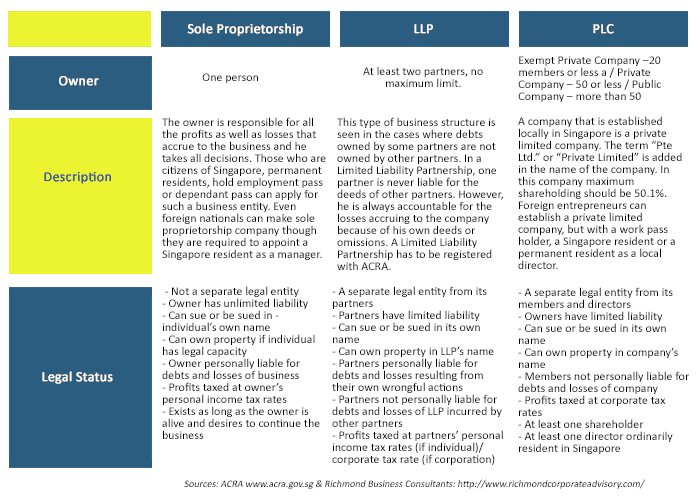 The Accounting and Corporate Regulatory Authority (ACRA) stresses that the name you plan to propose for your company should not be identical to another existing enterprise in Singapore. Choosing a name for your business is the first step in the incorporation procedure. But aside from legal requirements, you need to consider your branding and the possibilities that your business may attract in the long-run, such as expansion overseas. Hint #1: How do you want your target customers to feel about you? Do you want your brand to be friendly to families or attractive to high-achiever executives? Hint #2: Keep it short and easy to spell but flexible enough for web platforms and for future activities that involve the global market. This list of business name generators from Shopify can help you craft business names and check their domain availability. 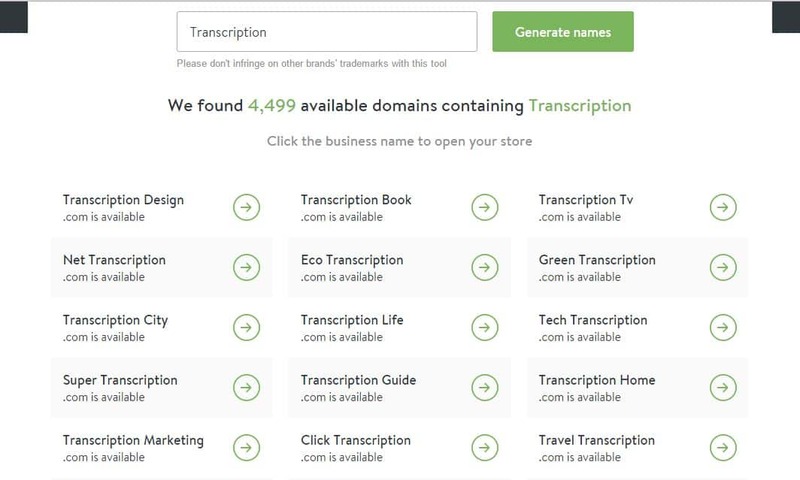 For example, if we use Shopify’s Business name generator and enter “transcription” in the field…. Hint #3: Observe the cultural practices and trends in Singapore. Will the people be able to relate to your company name? Does it have the potential to become a household name? Hint #5: Make sure it is not obscene, vulgar, or ambiguous. Hint #6: Is your proposed name apt for the company logo? Is the overall visual look powerful and unique enough? To sum it up, your name should stand with exclusivity, creativity, and clarity. It is essential that you know and understand all the requirements and procedures in registering a company in Singapore. This will help you gauge the working funds you need, the effort you have to exert, and the time you need to spend for your new business. A skilled Singapore company secretary is just one of the requirements before you can register your business. For this, some companies prefer outsourcing to minimise costs and at the same time enjoy the benefits of having a competent company secretary. 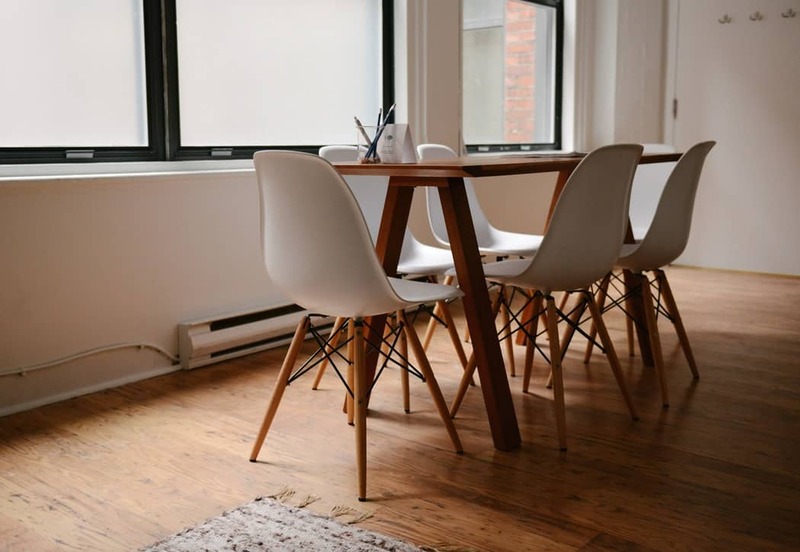 If your business does not require an office space, you may apply for your residential address to be considered as your registered office address through the Home Office scheme ran by the Urban Redevelopment Authority (URA). Alternatively, you can engage a professional service provider that offers registered office address services. A country’s tax regime is one of the most common concerns for many entrepreneurs. Luckily, Singapore has one of the lowest corporate tax rates in the region. The city-state also has a number of tax incentives and tax exemption schemes which have benefitted many enterprises through the years. Know more about the Singapore tax system here. The road to making your dream official is not an overnight trip but once you complete the route, arriving at your destination will be considered a milestone. Do you know the common misstep of most aspiring businesspeople? They do all the work by themselves. Remember: Your main job as an entrepreneur is to keep your business thriving. In fact, most of the problems of successful entrepreneurs when they were starting were about how to refine their services and identify opportunities. Not corporate functions. Not government requirements. Not neighborhood gossip. In short, they don’t boil the ocean. And mastering the art of delegation can set you apart as an entrepreneur. How do you avoid the mistake of overwhelming yourself? Tip #1: Right from the start, you need to recruit or partner with people who have the right skills and attitude. Invest in hiring the best talents who understand the core of your business, your objectives, and your overall vision. The key benefit of investing in this kind of business strategy is it allows you to devote your time and energy for both creative and moneymaking tasks. Can you already smell your success? Fear of failure, according to the 2014 Global Entrepreneurship Monitor (GEM) report, is a factor that can prevent an entrepreneur like you to set up your own business. The respondents who expressed the highest fear of failure were from GEM EU economies (40.7%), followed by Asia and Oceania region (37.5%). “Fear of failure can be a strong inhibitor for seizing opportunities and transforming entrepreneurial intentions into entrepreneurial activity,” GEM stated. One way to get rid of that fear is to take action now. You will never know what is out there for you if you have not even started approaching the door. So prepare all your requirements, contact the right people who can help you, and just do it. Ready to register your company in Singapore? Richmond provides a full spectrum of corporate solutions from Singapore company registration to corporate secretarial support to tax and accounting services. Let us assist you in your entrepreneurial journey.